When I was 13 I had a friend who lived in Russia. We were pen pals for years but, over time, our letters became fewer and fewer until we lost touch. About 8 years ago, I decided to try to find my old friend again and my search led me to ВКонтакте (VKontakte), the Russian Facebook. “The what?”, you say! VKontakte, now often called just VK, is especially popular among Eastern European users, particularly in Russia. In fact, back when I tried to track down my pen pal, VK was all in Russian and I was hopelessly lost. But by now, VK is available in other languages as well, including English. On VK, you have status updates, likes, groups, pages and direct messaging options. You can search for friends using their names, email addresses and other personal information and add them to your network of friends. Sounds familiar? VK works a lot like Facebook, and it looks a lot like Facebook too. The VK timeline will look familiar to Facebook users. You might never have heard of VKontakte before, but with 90 million active daily users it’s the largest European social network. Which is why we are adding it to the growing list of social networks Walls.io connects to, making Walls.io pretty much the only social wall with VK support. You can just hop into your Walls.io settings, connect your VK account in the “connections” tab and start adding profiles or communities to your social wall. Walls.io treats VK as a first tier platform. 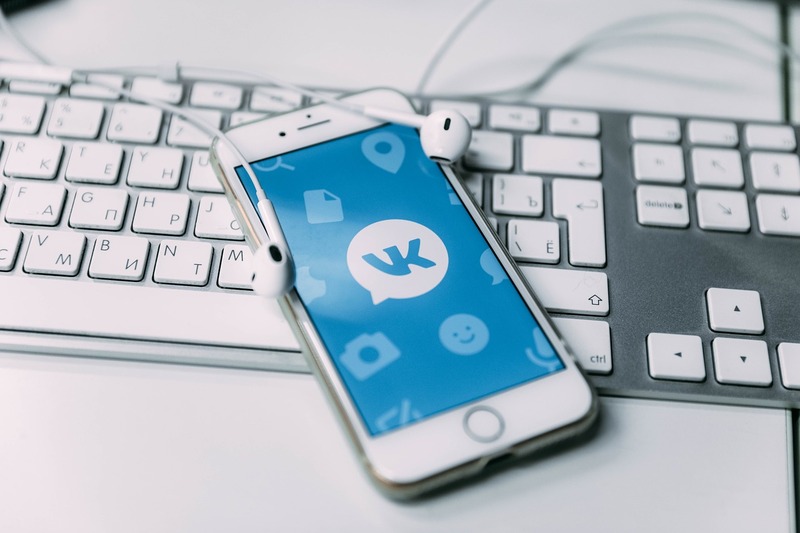 This means that, in order to add posts from VK, you’ll first have to authorise your VK account in the “connections” tab — just like you’re already doing with Facebook, Twitter, Instagram, G+ and YouTube. Authorisation speeds up your fetch intervals for posts, and your wall will refresh more quickly. By authorising the connection your wall with fetch posts from Vkontakte more quickly. To add VK to your Walls.io connections, head to the “connections” tab in your settings and scroll down to find VKontakte. Given you already have a VK account, sign in with your credentials and authorise the connection. Once that is done, head to the “sources” tab and click on “add source” and select VKontakte. You can decide whether to add content through a hashtag, a VK profile or a VK community. 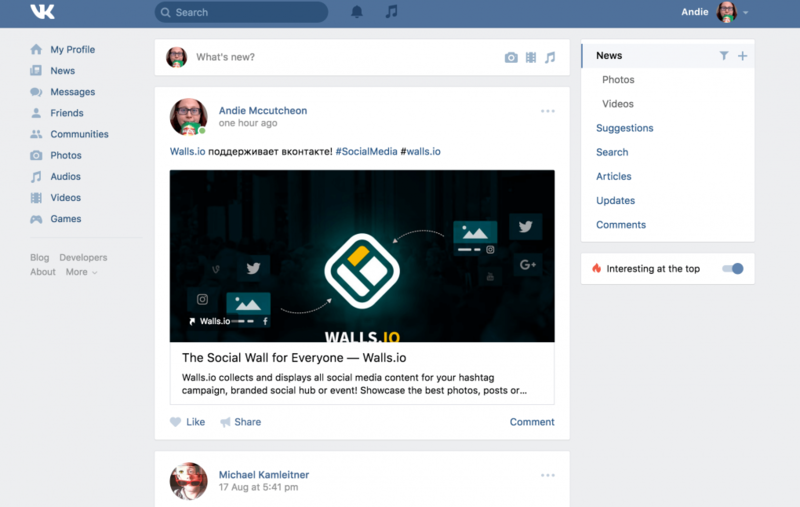 You can add posts from Vkontakte to your social wall using hashtags, profiles and communities. While Facebook has pretty much made hashtags obsolete, VK still allows us to fetch hashtags via its API. Many global brands have already joined VK: Coca Cola, Adidas, H&M or Skittles, to name just a few. It’s highly recommended for any brands who are looking to market to Russian users to also have a presence on the Eastern European social network. VK is the most popular social media website in Russia and the second most popular website overall, right behind Russian search giant Yandex. It’s also very popular in the Ukraine, Kazakhstan and Belarus. Russian users prefer VK over Facebook. And while many younger users seem to be ditching Facebook in favour of Snapchat and Instagram, VK has a strong hold on users under 30. The social network also collects a great amount of in-depth user information and has an excellent search algorithm. Brands can really narrow down to their target group when posting ads on VK. Have you heard of VK before or do you have an account there? Is your brand on VK yet?